Having won the trip advisor certificate of excellence in 2017 and rated in the top 4 places to eat in Ulverston, L’al Churrasco is a Mediterranean Tapas restaurant and bar situated in the beautiful lake district town of Ulverston. Now, the team at L’al Churrasco have chosen to demonstrate their love for sustainability and the environment by participating in the United Nations Environment backed Carbon Free Dining Certification programme. 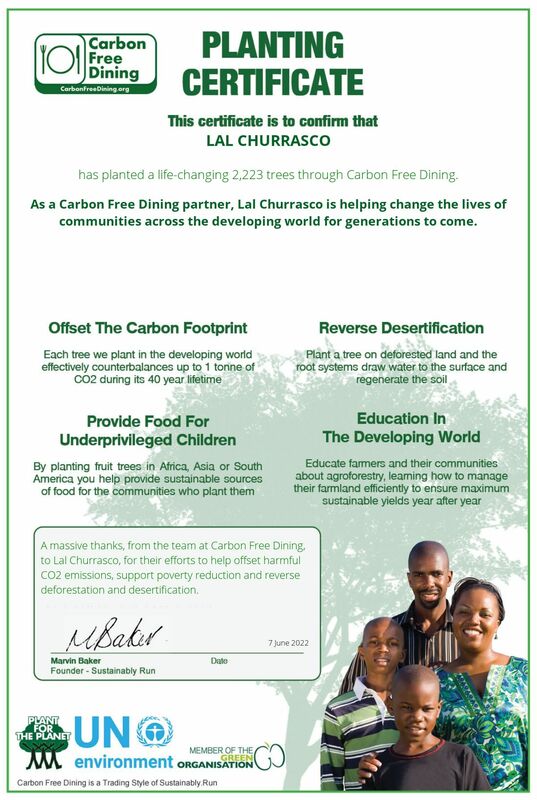 By being a Carbon Free Dining Certified partner, L’al Churrasco plants hundreds of trees each month, effectively counterbalancing the environmental impact of the meals it serves. This is done by simply giving its diners the opportunity to plant a tree with each bill for an optional 99p.